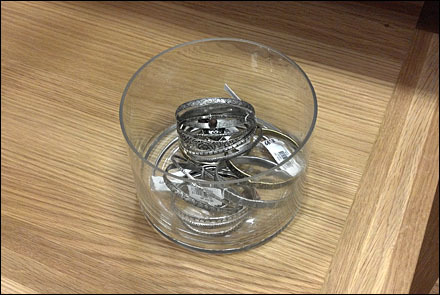 Bucket-like glass containers have a growing thread here on FixturesCloseUp. 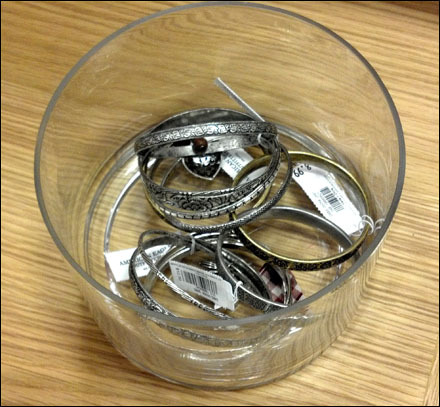 So the merchandising of bangles had to be included with other for complete coverage of the fixture approach. In many cases I like the massing of Glass Buckets or more visually intrusive display of items. In this case I liked the opposite, the underplayed approach to display. Surrounded by “negative space” and minimally stocked, the approach made me pause and wonder “What’s this?” CLICK the thumbnail for an alternate. PreviousPrevious post:Sephora Branded In-Store SeatingNextNext post:Bobbing-for-Bracelets Or Other Merchandise?